This imposing house on Old Highway 16 in North Gower was built in 1924 as a dream home for the first wife of one of North Gower's most active citizens, Dr. H.G.F. Blair. Dr Blair was a graduate of McGill University's faculty of medicine and served as community doctor for 42 years. The nature of his work and his community involvement and membership in such organizations as the Masons made him a well known and popular local figure. In 1922, Dr. Blair bought the land for his new house from R.A. Craig for $375. The house, with its distinctive Greek-columned front porch, was built with Boyd blocks from Osgoode. In 1924, the Blairs moved from their white clapboard house at 2324 Roger Stevens Drive into their new house. The south-west corner was devoted to the doctor's professional practice. Patients entered through a door on the west side which still exists but is not used, and entered a waiting room. On their right was a small examining room and on their left was the wall that separated the rest of the house from the office. The top half of this wall has now been removed. Underneath the central stairs is a cubbyhole which in Dr. Blair's time held a very large and heavy safe. In the 1950's, the safe was sold to Mr. Harry Wright of North Gower who used it for his own business [Wright's Plumbing]. The stable at the rear of the lot, which housed the two horses used by Dr. Blair for house calls, still stands . Dr. Blair died in 1942. 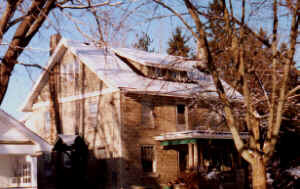 His widow sold the house in 1946 to Winnifred McCormick, and in 1948 it was purchased by David and Betty Williamson, both of whom were artists. Doubtless many local residents and passers-by remember with pleasure the sculptures which adorned the garden - the creations of Mrs. Williamson who subsequently held for many years an appointment as Artist in Residence at the Guild of All Arts in Scarborough, Ontario. The house changed hands again in 1971 and 1975 and was purchased by the present owners in 1985. 70 The "Presence of the Past" article for March, 1987, goes on to an interesting discussion of the Boyd Brothers and Boyd Block construction, which is not specific to this house.